David takes a shot at Cafe Wha? 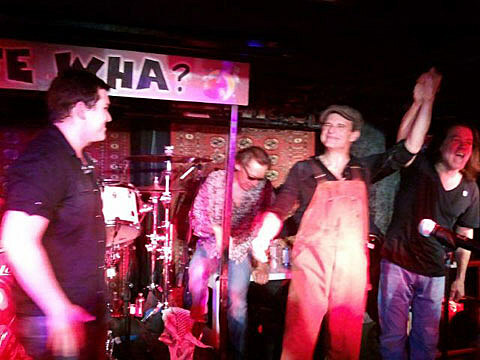 As promised, Van Halen (Eddie, Alex, Wolfie & David Lee Roth, but not Michael Anthony) played a super intimate show at Cafe Wha? in the West Village last night (1/5). David said the last time he played a stage that low he had to get the car back before midnight. He said he was more nervous playing Cafe Wha?, where he can’t hide, than any stadium (“no fake vocals at this show” he noted…). Part of that nervousness came from the fact that it was more than just a small, old, legendary venue where they chose to play a press-only show. It’s also the club that David’s uncle Manny Roth used to own, and Manny, now 92 years old, was in attendance. David mentioned he was 7 years old the first time he was there, but never got to play on that stage – “it was harder getting this gig than getting into the rock n’ roll Hall of Fame,” the rock star-turned EMT-turned rock star joked during one of his many monologues during the hour+ show. He talked about living on the LES, wanting to meet Lady Gaga, being an EMT in NYC, playing clubs in Southern California, and various other topics in between playing the hits (and one new song). Full setlist and some videos below. With those words Eddie Van Halen kicked into the opening notes of “You Really Got Me” and the crowd -composed almost entirely of journalists and music industry insiders – went absolutely bonkers. Over the next hour, the group played a stunningly tight set of songs from their 1978 debut LP all the way through David Lee Roth’s swan song, 1984. It was a show guaranteed to make any crowd go into a collective state of hysteria, but the happiest man in the house could have been Roth himself. 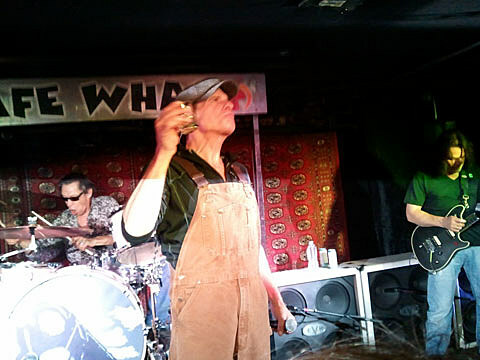 Dressed in beige overalls and a Brian Johnson-style newsboy hat, the singer had an ear-to-ear grin on his face all night..
Van Halen, Rock And Roll Hall of Fame inductees and one of the most important and influential rock bands of all time, announced their return to the live stage with an extraordinary 2012 North American tour. The announcement was made late last night, during a once-in-a-lifetime performance, at the intimate Café Wha? in New York City. Known around the world for some of the most iconic live performances in music history, the legendary rock band will begin their tour on February 18. Kool & The Gang will join Van Halen for select tour dates. In addition, Van Halen confirmed their new album, A Different Kind Of Truth, will be released in the U.S. by Interscope Records on February 7. The first single from the album, “Tattoo”, and its accompanying video will be debut simultaneously on Tuesday, January 10th, with album pre-orders starting that day. A Different Kind Of Truth is Van Halen’s first original studio album with singer David Lee Roth since the band’s classic multi-platinum album 1984. Fans can expect Van Halen to perform selections from A Different Kind Of Truth alongside songs from their arsenal of epic hits that include: “Eruption,” “Running with the Devil,” “Jamie’s Cryin’,” “You Really Got Me,” “Ain’t Talkin’ ‘Bout Love,” “Everybody Wants Some,” “Unchained,” “And The Cradle Will Rock,” “Beautiful Girls,” “Mean Street,” “Somebody Get Me A Doctor,” “Jump,” “Panama,” “Hot For Teacher,” “I’ll Wait,” and more from their classic albums Van Halen, Van Halen II, Women and Children First, Fair Warning, Diver Down and 1984. Van Halen – who the Los Angeles Times recently called “a force of nature” and “one of the flat-out greatest rock bands on the planet” – was inducted into the Rock And Roll Hall of Fame in March of 2007. Formed in Los Angeles in 1974, Van Halen changed the rock and roll landscape forever with the release of their self-titled, 1978 debut album displaying unparalleled stage presence, revolutionary musicianship, and extraordinary songwriting abilities. With more than 75 million albums sold worldwide, the band’s record of achievement is hard to top. Among a long list of awards, recognition and accolades, Van Halen joins an elite short list of two time Diamond Award honorees in the history of the music industry. Presented with two Diamond Award RIAA Certified Status’ for their albums Van Halen and 1984, the band has produced a repertoire of hits that remain some of the strongest and most influential rock songs ever written that fans will admire for decades to come. Kool & The Gang found a special sound at the unique intersection of jazz, R&B, funk and pop. Their music has been created by the same core of players for over thirty years: Robert “Kool” Bell, his brother Khalis Bayyan, their longtime friends Dennis “DT” Thomas and George “Funky” Brown.